The 2018 State Multi-Disabilities Championship are on now, having started on Thursday, 19th April and reaching finals on Saturday, 21st April 2018.Sectional Play and Semi-Finals were played at North Bendigo BC, and tomorrows Finals are being played at Bendigo East tomorrow as part of State Champions Week. 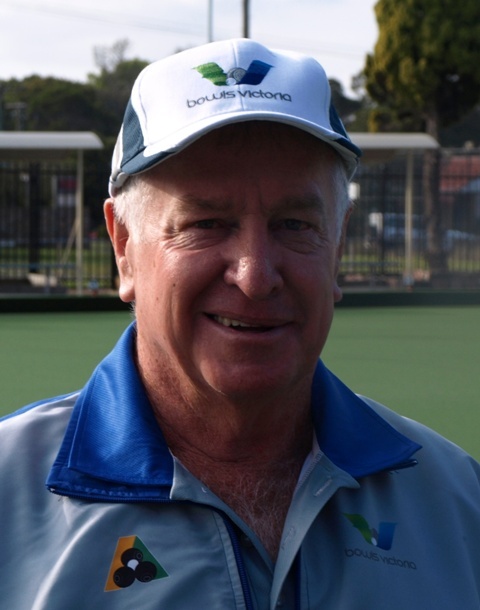 Our Armed Bowlers, the well-known, eats bowls, Mordialloc player Peter Dixon, partnered by Gerry Carton, having won their Semi Final of the Pairs at North Bendigo today (12-5), play the Final tomorrow at East Bendigo. They defeated Dylan Jack Weaver & Lynette Hamblin in Rd. 1, 12-10. Round 2 saw them defeat Jo-Anne Boland & Gwen Faris 17-2. Round 3 pitted them against Gary Cantwell & Stuart Betts, a game they won 15-8. They had to play former combatants Dylan Jack Weaver and Lynette Hamblin in the Semi Final, late in the afternoon, winning 12-5. We wish Peter and Gerry and all competing tomorrow a great game, we’ll let you know as soon as we can how they fared. Postscript: the second photo tells the story 1 up (13/12) in the Final of the Physical Disability State C’ship Pairs. Numero Uno well done guys! They led from the first end and on the eighth end it was all square, a four on the ninth sealed it for the lads, who held on to win by one, and claim the gold medal. Karingal Armed Bowler, Carolyn Burgess skips big win in the Edithvale Frank Baguley Ladies Triples on the 8th Apr ’18. The major prize was $900 for the winning team. Her teammates were Edithvale’s Mary Weston and Barbara Sharp. Frank Baguley (97 this year) and an Armed Bowler himself, plays Tuesday Night and Saturday Pennant was on hand to hand over the money. Well done girls! 27 Mar ’18 – Congrats to Winner, Ann Power and Runner Up John Cobden in this years City of Frankston (Club Event) Open Singles Armed Championship. The Ashley/Sissons Trophy went to Ann this year, “Hand It Over!” Cobbo! (John Cobden was last years winner). A great struggle for both, over 3 hrs and 32 ends! AND a great spectacle for the gathered supporters of Bowls, armed or not. 20th Mar ’18 – Latest news from Bowls Vic. Click Here. Armed Bowlers Australia congratulates Armed Bowler, Lee Wesley, on becoming the Central Highlands Bowling District, Champion of Champions (Singles) today (11th Feb ’18). He defeated Wayne Turner and P Linehan in extremely close games that could have gone either way. Well done Lee! Luke Licina, Myotherapist, at Applied Health, Keysborough is closing down his Lawn Bowls Shop business on 16th Feb. ’18. I’ve already snapped up some bargains, and so can you! Luke is well known in the Keysborough area and plays Tuesday Night Pennant for Keysborough B. C. , and you may have seen him, daughters in tow, on Keysborough’s Big Days, displaying and selling his bowls clobber and equipment. Please support Luke and check out his closing down specials……you’ll be surprised at what he can do for you. Contact luke@appliedhealth.net.au or talk to him on Landline 9701 5757 (Bus. Hours) or Mobile 0412 543 566. He has, in stock, items big and tiny, all need to walk out the door. Grab yourself a bargain! ABA congratulates City of Echuca’s armed bowler Joan Moss on her excellent results at this year’s Vic. Open. Joan made the last 16 in the Women’s Singles and the Quarter Final of the Women’s Triples, bowing out at one shot down. Edithvale Armed Bowler Frank Baguley, turns 95!!! What a Legend. He Plays Tuesday Night Pennant, Fridays and Saturday Pennant. He enters all club Tournaments and this season puts up the prize money for a SUPER 3 DAY CARNIVAL from Friday 6th Apr ’18. He was an inaugural winner of the City of Frankston “Battle of the Arms”. You can read more about Frank under Armed Bowler Profiles. Bowls Tasmania have approved the establishment of a committee for Bowlers with a Bowling Arm Tasmania (BWBAT) to help develop Arm Bowling in Tasmania. “Immediate goals are to secure a base of Registered Bowling Arm Players, to develop Arm Coaching offerings, run Arm only events and hopefully to secure a side of 17 including at least two ladies or more on ability, for the 2018 National Bowling Arm Championship in Newcastle. The State team is likely to be known as the Tassie Demons. Arm Bowlers in Tasmania should make contact with the Chairperson, Owen Preston on 03 6302 3377 or email ellis96@tpg.com.au and stay tuned to this website for news and reports immediately they occur. Become a “follower” and receive an email when new posts are made. An interesting article from the Sunshine Coast Daily noting the State Selection of Geoff. Geary to the Queensland Armed Squad and his wife Mary to the Queensland Over 60’s Squad. Well done to the Geary’s! 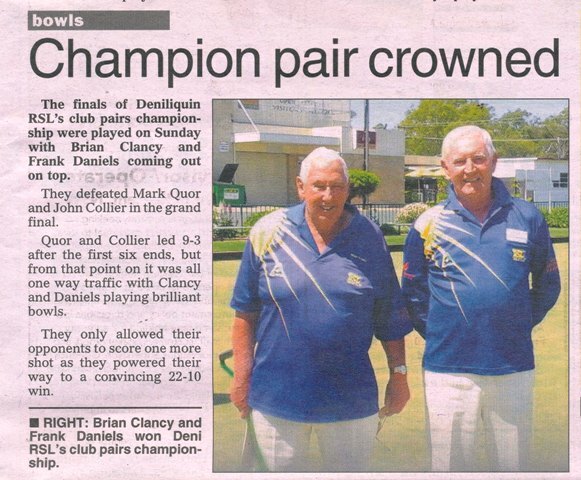 ABA congratulates Armed Bowler’s Brian (Clanga) Clancy and Jim Jennings on becoming Life Member’s of the Deniliquin RSL B. C. Without the Arm, Brian & Jim may have not reached this pinnacle, nor would their Club have enjoyed the gift of their expertise. Picture – Jim Jennings, Aileen Daniels, Ron Charlton & Brian Clancy on becoming Life Members of the Deniliquin RSL Bowling Club, courtesy of Cheryl Bradley. V.I P. message from the Victorian Coordinator of Arm Bowlers in Vic. I am writing to ask you to consider playing in the upcoming Victorian Open to be held in Shepparton very soon. The event will be conducted from Saturday 5 November through to and including Friday 11 November 2016. Arm players are doing well in Pennant and Open competitions so why not give it a go and show how effective you can play. Perhaps play with non-arm players or field a full arm side? Opportunities exist in Singles, Pairs and Triples for both male and female entrants and in Mixed Pairs. You can register by accessing the Bowls Victoria website by clicking here. You’ll have to act fast as entries close on Wednesday 12 October 2016 at Bowls Victoria. THEY’VE been labelled cheaters by critics but arm bowlers say they simply want to continue playing the sport they love. The Bowlers Arm National Championship is being held at Broadbeach this week and Queensland is competing for the first time. Among the state squad is a trio of Kawana rollers, Ken Muir, Geoff Cooper and Bill Roberts. Muir, 67, started using an bowling arm – a device which allows competitors to roll while standing up – after his left knee gave way. At first, he was frustrated but he realised he wouldn’t be able to bowl without it. “I was ready to throw it over the fence. The only reason I didn’t was because I couldn’t climb the fence to get it back,” he said. “I can’t bend down any more so it was a case of grab a hold of those arm or stop playing bowls,” he said. He’s set to have his knee replaced for the third time after this week’s tournament. He said “99%” of people using the bowling arms genuinely needed them. He was part of a team of arm bowlers which competed at the Australian Open against all-comers recently, winning their pool games before bowing out..
An ex-club champion and district player, he was intent on staying in the game. “I couldn’t bend but I went and got an arm and within three weeks I was back on the bowling paddock,” he said. He said many arm bowlers were “immensely competitive”. “(But) some people don’t seem to like it that much. Some young bright-eyed and bushy-tailed people seem to think it’s a bit of an advantage but it’s not, all it does is let older people (and those with injuries) continue playing their sport without suffering. He said arm bowlers required a doctor’s certificate and registration to use arms in competition. At a local level, the Arm Bowlers Challenge Pairs will be held at Mooloolaba on September 14. Fourteen teams have registered but there is room for more. 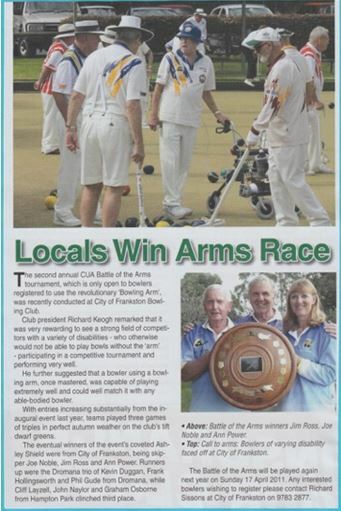 Article in the Queensland Bowler Magazine, September Issue. Congratulations Ian! Vic. Pennant Draw out, 19 Aug ’16. For those that remember and much admired Patrick McErlean for his early Sunday morning “Lawn Bowls World” radio program. A fond Vale Patrick. Patrick died in March this year but this article by Leanne Edmistone is the one that best describes our dedicated supporter. Well Patrick, what a wonderful difference you made in sport. 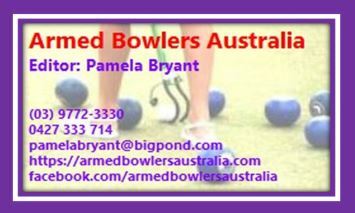 Queensland Armed Bowlers pal up for the Aust Open in June. The Ladies Team pictured from left to right consists of Cheryl Hutchinson from Club Helensvale, Carole Azzopardi from Mooloolaba Bowls Club, Wendy Usher from Dalby North Bowls club and Lynn Gilbert form Capalaba Bowls Club. How the Bowling Arm changed Lara’s life. Last year Vic. State Rep Stephen, from North Balwyn, was in Perth for a few months. During his stay, he was welcomed to play at the South Perth Bowling Club. At that time, Stephen was approached by coach Kathryn Neville, and asked if he could assist Lara, the daughter of one of the club members, to use a bowling arm. Kathryn was unable to find coaching information on the bowling arm within Western Australia. Lara had been an active softballer, squash player and netballer until a debilitating stroke impacted her young life and sporting career. Twenty years later while watching and supporting her mother play bowls at South Perth BC. Lara thought she may be able to give bowls a shot – and the advent of the bowlers arm was her ticket to take up sport again. Lara’s infectious laugh and her great courage and persistence gave Stephen plenty to work with. He showed her how best she could use the bowling arm, taking small steps to build her skills and confidence. By the end of the first session Lara was bowling using Stephen’s bowling arm competently. The experience was filled with emotion and her successes were celebrated with high fives and big smiles. Lara was then off to a bowling shop to purchase her own bowling arm. As Stephen was returning to Melbourne and club coach Kathryn was going to continue to coach Lara, Stephen spent time with Kathryn on how to use the bowling arm and mapped out drills to help improve Lara’s technique and skills. Her rise has been incredible – all the way to recently representing Western Australia at the 2016 Multi-Disability Bowl Nationals in South Australia. Lara now regularly plays for South Perth BC in the scroungers competition on a Tuesday night and has become a regular player in the ladies Friday night pennant team, and also played in the WA Multi-Disability Championships in April 2016. With the support of Bowls WA, in particular Inclusive Practices and High Performance Officer, Denise McMillan, Lara also now receives specialized coaching with experienced Rossmoyne Bowling Club coach Allen Petchell in addition to her regular work with Kathryn. It’s a great story of compassion, inspiration and determination, and shows the value of the bowling arm within the sport. The bowling arm, first invented by Trevor Harker, has allowed bowlers to continue to play the sport and allowed new bowlers like Lara to take it up, which can only benefit clubs and the community as a whole. 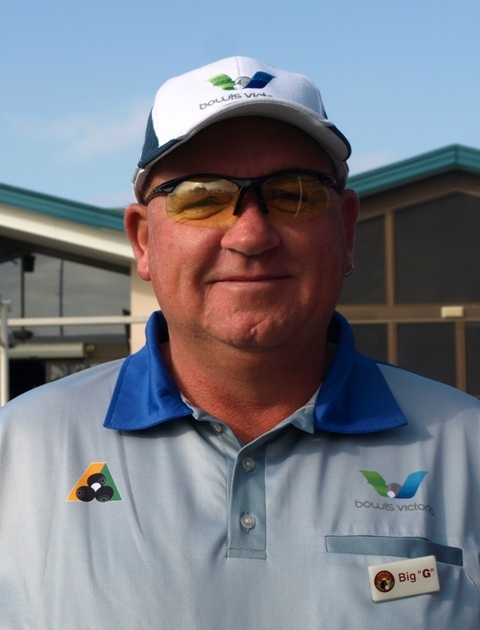 Here in Victoria, we are fortunate to have the support Bowls Victoria provides to the Bowling Arm fraternity – in particular Phil Gude who has been developing and coordinating the Bowlers Arm coaching clinics and is one of the key drivers for the National Bowling Arm Championships. Alison Meakin of Mulgrave Country Club did very well in the Singles at the Aust. Open. this week and has several other events to look forward too. Next week she plays in the disabled section in singles and pairs and is so looking forward to that. Let’s get behind Alison and wish her all the best for the remainder of her Aust. Open Challenge. Alison is a fellow Armed Bowler with several Club and Regional wins under her belt. Armaroos visit to New Zealand. Last 2 day’s for our Armaroos in NZ. Report from our travelers. Well done to all you did us proud. Day 10 NZ Trip: Well we started off the day with a sleep in until 7:30am. Unfortunately, we had a significant amount of rain last night but the weather man was telling us that there will be no rain today with a chance the sun might even pop its head out of the clouds. Most of us went for a walk around the city streets this morning doing last minute shopping and maybe a coffee or two. At 10am we jumped on the bus with Lyn and headed to Browns Bay bowls club which is a really lovely club with 4.5 greens 3.5 grass, 1 carpet. Unfortunately, due to the heavy rains last night leaving the greens flooded we had to play on the 10 rink carpet green, which was a very nice 15.5 seconds. Adele Ryan, Phil Gude and myself lead a group of 20 people for coaching. About 6 of them were actual coaches themselves and were there to learn off us how to coach arm bowlers. One couple in particular traveled 2.5 hours just to be coached by us. This group was very dedicated and really wanted to learn. We then headed in for lunch which was a very lovely. The team then relied together out on the green for the last time to do battle with what turned out to be our toughest competition yet with the Aussies actual losing overall by 2 shots. 3 rinks down (Ansett, Long, Corrigan) and 2 rinks up (Egge and mine). I unfortunately didn’t skip today my health took a turn again and I was unable to stand straight without my head spinning. Stan Swalinski from NSW took my spot and I played second. There was however a joke going around that they were going to get Lyn our bus river to play in my place but they couldn’t because my Arm is taller than she is. We then jumped back on the bus and headed for our motel over the beautiful harbour bridge. The team then all went out for our farewell dinner at the Lord Nelson Restaurant next door. We shared stories and memories of our trip and enjoyed a fantastic meal. Tomorrow we all set sail for home the SA leave at 8am and NSW and VIC at 9am. Day 9 NZ Trip: Today saw one of only 2 cloudy days with rain in the afternoon. We started off by packing the bus with Lyn and we headed off to the Stadium Bowls Club (formally city of Hamilton). Adele Ryan, Phil Gude and myself took a group of very enthusiastic people for coaching we also had a couple of local coaches that wanted to learn how to teach people with bowling arms which was fantastic and shows maybe we are getting threw to the NZ bowlers. Unfortunately, the club is going through some issues at the moment and only had 14 players to rival us so we played 3 teams of 4 and 1 pairs. It also gives some players that haven’t been well a rest. The Aussies won well with all rinks up but my rink won 35 – 1 after only 12 ends. I am not gloating, the opposition played OK but when your team are playing as well as mine did it’s easy. We even picked up 5 shots were there wasn’t a bowl outside 12 inches. We then had a magnificent lunch were you had the choice of pies, pasties, make your own fresh bread rolls, cakes, slices and scones. Once we had eaten the best preformed Aussie rink was given a hat from the club as a reward. We then jumped back on the bus and headed for Auckland but of course we stopped for ice creams and a Toilet stop in the little town of Bombay. The ice cream stores compete against each other and you can even get a 12 stack ice cream but nobody was game. We then continued on and arrived at the motel. After a rest we went for dinner it was some free choice tonight so Barry Anset, Ray Arnold, Ann Power, Adele Ryan, Heather & Tony Long and myself went to the casino for the best burgers I have ever had. Tomorrow we have free time in the morning then head for Browns Bay bowls club for coaching and the last game. We then have our final dinner together before we fly home. 9th-11th May ’16. Well today we said poroporoaki (goodbye) to the magical Lake Taupo, we are headed for Hamilton. On the way we stopped at Huka Falls. It was beautiful seeing the crystal clear water and the raging torrents and at the bottom of the falls a pretty rainbow. We then continued on to the fascinating Wairakei Geothermal power fields which turns the steam into electricity this station produces 8% of the power for NZ. As with all our long trips we stop off for coffee and a toilet break which was at the quaint town of Tirau. It has the most fascinating corrugated iron sculptures, buildings and signs with fantastic little cafes. We then continued on to Hamilton were we stopped for lunch in the heart of the city and picked up one of the local bowlers to take us to see the Hamilton Gardens and see some of the local buildings. The gardens are absolutely enormous we didn’t even have time to see it all but we finally got to see New Zealand’s famous Silver Tree Ferns and various other gardens. The team then asked Murray out local bowler could we go and have a practice at the local club which of course he said yes. Some did stay at the motel but most of us went to this massive club with 3 greens but only 50 members which is unreal. We had a roll playing 2 bowl pairs. We then traveled back to the motel to get changed and headed out for dinner at the local RSL club which was a very nice meal indeed. Tomorrow we are coaching in the morning then playing the locals from stadium bowls club Hamilton then we set sail for Auckland again. Lee Wesley. Another victory at Hamilton. The Big game is on tomorrow against Browns Bay Bowling Club Auckland. Ann Power. 8th May ’16. Well we started off were we always do packing the bus ready for the trip to Taupo. Just as we boarded we made a special presentation to Lyn our Bus Driver or as we all call her mother Lyn for Mother’s Day. We then set off through the fields, mountains and forests towards Taupo. Lyn then surprised us all by showing us the most beautiful waterfall Waipunga Falls. We arrived at Taupo which overlooks the largest inland lake in New Zealand. We had some lunch and s look around town then off to the dock for a cruise on Lake Taupo. We set off into the distance to see some beautiful Maori carvings in the rock face and some of the boys did some trout fishing and they even caught some. The guides had prepared us all some wonderful afternoon tea and then even prepared the fish the boys caught both raw like sushi and cooked on the BBQ. We cruised back into port and were taken to our wonderful accommodation Wellesleys Hotel. Then free time for the rest of the evening. Tomorrow we play the locals at Taupo Bowling Club. The Traveler’s all. 7th May ’16. Well the morning started off interestingly we got dropped off by Lyn to this walkway between the houses, as we walked up here is this magic little bowls club Kia Toa with 2 tiger turf carpet greens and a large clubhouse. The greens were covered in dew which made for an educational roll-up as the green was running about 15.5 seconds. We were greeted by the mayor of Hawks Bay Council and various other officials then the games begin. All rinks got off to a flyer then the dew come off the green and the sun come beaming out, the green then dropped 1.5 seconds of pace to about 14 seconds. The Aussies took a bit to adjust but once we did off we all went getting all 5 rinks up. GO AUSSIES. In for lunch which was a selection of sandwiches, savory’s, cakes and fruit. Then back on the bus for a bit of a tour around town to see Watties food factory, orchards and a bit of local art and statues. We then headed to the new Club Hastings were we greeted with a gorgeous two course meal of either chicken or steak and veggies and cheesecake, chocolate cake and ice cream for desert. We then jumped back on the bus ready for the motel. Tomorrow we are off to Taupo for a cruise and afternoon tea around Lake Taupo and off course a bit more sight seeing should be fun. The Traveler’s all. NZ Herald Report on our Armaroos visit. Click here. 6th May ’16. We packed up the bus and headed for Napier, on the way we stopped past the mud pools and the hot springs which was Mother Nature at its best. We arrived at Napier through the port and then in the distance you could see the magical Art Deco buildings and gorgeous beach front. We stopped for lunch and had a walk around I think nearly all of us walked into O possum world to see possum fur mixed with Merino wool to make some magnificent products jumpers/hats/toys. Then back on the bus with Lyn and off to Hastings. We had a meal together at the Angus hotel which they all said was very nice. Tomorrow we play Kia Toa bowling club which according to the locals are pretty tough as they have won a few pennant titles recently. Lee Wesley. Spent yesterday sightseeing in Rotorura and visited the Maori Village in the evening, had a wonderful night. Now in Hastings for 2 days, another game tomorrow. Alan Starratt and myself were interviewed by the local paper so will be in the morning edition. 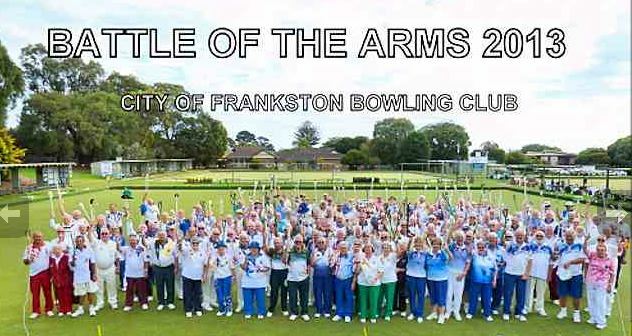 City of Frankston’s involvement with the creation of the Arms Tournaments should be featured as well in the article. Ann Power. Meet our coach driver Lyn and squad bowler Lee. Amazing lady with all the local knowledge. Been driving around New Zealand for 28 years. This is the job you do when you’ve had enough of nursing. Lee Wesley. 5th May ’16. Wow what a day. Mt. Maunganui made us feel most welcome. President of Bowls New Zealand opened the event after we marched out with the flags. The ARMAROOS had another win, our rink had a very good win. The seafood lunch was delicious; we were then presented with lots of lovely goodies including the one twist memento. Ann Power. 5th May ’16. Well again as promised NZ delivered on the weather with a magical sunny morning at Mt Maunganui Bowls Club Adele Ryan, Phil Gude and Myself ran a coaching session with about 30 bowlers ranging at different skill levels. Everybody that attended the session was very happy and took a lot out of the session. We then lined up for the playing of both the Aussie and NZ national Anthems. Then the competition began it was very close at first with the locals taking a slight lead then the Aussies pounced of course we won 3 rinks to 2. Shock horror I even won my rink. We then had a magnificent lunch supplied by the club of seafood and salad and for those not into seafood a lovely chicken in mustard sauce and salad. We were blessed to have the President of Bowls New Zealand there to watch us play and join us for lunch. Mt Maunganui then gave us a fantastic gift a local Maori art piece. Then we took the bus to Rotorua along with seeing the sights on the way like the local springs and heritage buildings. At 5:30 the group then split most heading to dinner and show in the traditional Maori Way and some just going to a local restaurant. Tomorrow we are off to Napier to see the sights and then down to Hastings ready to play our next game Saturday.Lee Wesley. 4th May ’16. Day 3. Well Day 2 over and done traveled 4 hours to Tauranga. We’ve seen some absolutely spectacular scenery mountains, forests, goldmines, rivers and streams and even a train line through the mountains. When we arrived you are overlooking a big port on one side and golden beaches on the other. A bit more sightseeing then a magical dinner at Mt Maunganui bowls club with the local players that we will be competing against tomorrow. Day 3 will see us coaching the locals then the big game against Mt Maunganui and the president of New Zealand.Lee Wesley. 3rd May ’16. The Armaroos had a great day on the green. Excellent indoor facility. Lee & Adele coached the “Bowling Arm “New Zealand players while the rest of us practiced for the afternoon game. Our rink had a very good win, an overall win against the Clubs “hand bowlers”. The club presented us with medallions to commemorate the event see below. Lovely people. Ann Power. 3rd May ’16. We had a great day at Pukekohe cosmopolitan bowls club. It started with me and Adele Ryan doing a coaching session. A fantastic lunch then a great game of bowls Australia won 3 out of 5 rinks and won the day. I got beat by 6 shots but considering we dropped 13 shots in 3 ends not a bad effort. The locals over here are fantastic and very kind. Tomorrow we are off for sight seeing in Tauranga about 3 hours from Auckland should be fun. Lee Wesley. 3rd May ’16. Day two finished with our first encounter with the Kiwi’s and the Armaroos had a good win. Three rinks up and two down. Happy to say my rink had a win by one shot. Tony Long. 2nd May ’16. The Armaroos arrived safely in Auckland, on a beautiful and calm evening. Bowling at 10 am tomorrow. Looking forward to the 20 sec greens!!! This will be an experience. Goodnight everyone! Ann Power. 2nd May ’16. Feeling super excited tonight I am off to New Zealand Tomorrow morning to represent my Country in the First Ever Australian Bowling Arm Side. I will also have the pleasure of doing some coaching over there as well. Coming with me from Victoria is Barry Anset, Phil Gude, Ray Arnold, Tony Long, Ann Power, Adele Ryan, Doug Corrigan and Harry Dalhoff. I will keep everybody posted of my trip. Lee Wesley. Stay tuned to this page when the action starts in May! VIC – Barry Anset, Ray Arnold, Doug Corrigan, Harry Dahllof, Phil Gude, Tony Long, Ann Power (pictured below), Adele Ryan, Lee Wesley. Congrats to Fiona McNamara on winning Heatherdale’s Ladies Club Championship, Ladies Pairs and the Ladies Proportional this 2015/16 season….fabulous effort Fiona! Congrats to Armed Bowler Bob Ormisher (Skip) and his City of Frankston team Pers Lienors, Kevin Couglin, Peter Armistead on winning this years “Roy Armistead Memorial Tournament”, played at NYAH District Bowling Club near Swan Hill. The Roy Armistead Day is named after Peter’s late father. The green they played on was also named after him. They won 3 games, 19-12, 18-3, 13-10. Peter’s family were most excited about the boys win against the locals. Armed Bowler The Big G (Graeme Edwards) was also there in a hot field of classy competitors. The photo was taken for the Local paper. Thanks Ann Power for the details and photo. Who’d want to be a Selector? The things we do say? Peter’s first poem for us is lower down the page in Oct. 2015. About Fiona McNamara – Armed Bowler Heatherdale. 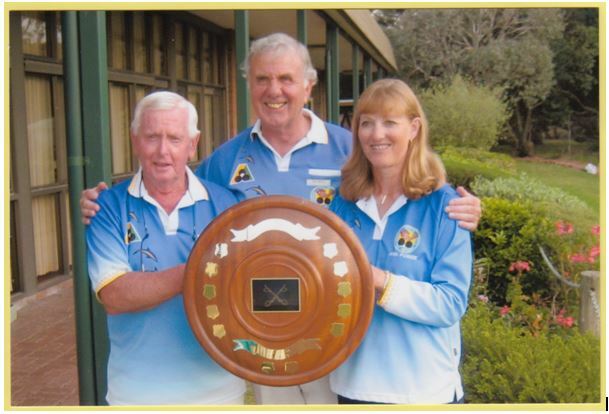 Mulgrave Country Club Armed Bowler Alison Meakin won the Eastern Ranges Singles and is Runner up in her Club Singles…. to top off the season a Div. 4 flag. Well done Allison! Romsey Armed Bowler and State (Armed) Squad member Lee Wesley has won his first “Club Championship!” defeating Matt Brundell 25-13 in a game exuding experience, skill and friendship. The temperature soared to 36.9 but they battled on regardless. Congratulations to both players! Romsey Club Champ Lee Wesley (L) and Runner up Matt Brundell. 28 Oct ’15 – Thank you Peter Hemmens of the Belmont B. C. for this little gem. The subject is the Bowler’s Arm…………. (to read the poem in its entirety click here). 8 Oct ’15 – Cec and Joan Moss “3rd at Frankston, 3rd at Finley, 3rd at Corowa. I can see a pattern forming!” Wish my pattern was that good! Check out this article on Armed sensation Neil Crisp (Crunchie) from Bowls Vic. OR Check out how he taught Steve Glasson to use an Arm from Bowls Aust. 2014 Report by the “Northern Argus” in South Australia on “reducing harm with the arm”. Click this link. NORTH Balwyn bowler Stephen Coles recently added a national title to his already impressive list of club titles when he was a member of the Victorian armed bowlers team that won the inaugural Bowlers Arm National Championships. Bowlers with injuries or physical conditions that prevent stop them playing lawn bowls effectively are able to can get authority permission to use a mechanical arm to overcome any ­inability to bend properly.Coles has recently developed a back problem that was threatening his ability to continue in the sport, so he turned to the arm.After working diligently, Coles made his way through an exhaustive selection process to be chosen to play for Victoria at the national armed championships in Corowa.Not only did the Vic’s ­secure the overall national title but they claimed individual series wins over New South Wales and South Australia in the process.Victoria defeated New South Wales 31-14 and South Australia 25-10. New South Wales beat South Australia 26-14 in the other game to leave Victoria on top of the ladder, with 56 points, followed by New South Wales (40) and South Australia (24). (Photo and Story courtesy of Progress Leader 2013). Bowls Victoria Director Phil Gude who is the Coordinator of Victorian Arm Bowling Events met with 99 year old Trevor Harker, the inventor of the Bowlers Arm at Portarlington BC to say thank you for his incredible invention. 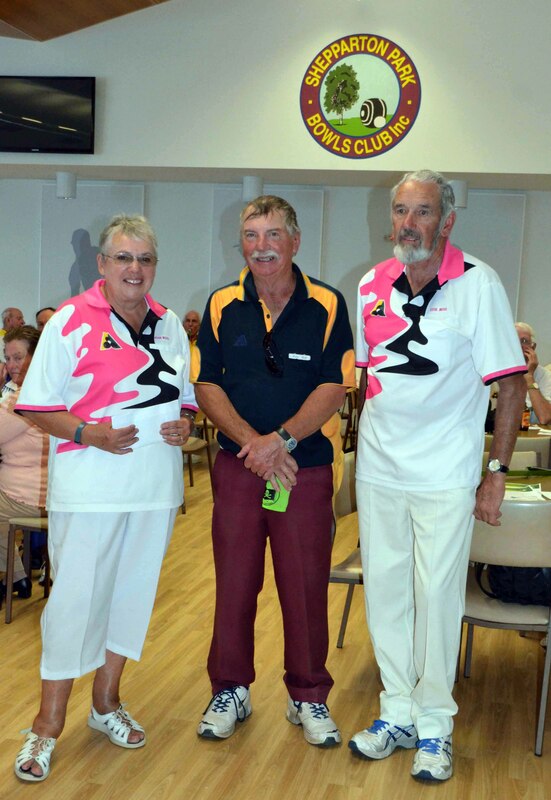 Accompanying Phil Gude were two members of this years Representative State Bowler’s Arm Side, Adele Ryan from Ocean Grove and Tony Long from St. Leonards. Phil Gude stated “that with Victoria winning the National Bowlers Arm Sides Title last year I thought it would be great for our near centurion to see what all the fuss is about.” The three trophies won at last year’s event staged at Corowa Civic BC were put on display for Trevor to view and Phil presented Trevor his own personal Victorian State Cap worn in that event as a mark of respect to the man that virtually started the Bowling Arm concept. Click here for a list of all approved Bowling Arms. The State Arm Bowling Squad of 18 players played a trial match against renowned International Coach Lachlan Tighe’s Elbows Side – made up from Premier and Metro players from Melbourne BC, Donvale BC and Vermont South BC. The Armed Vic’s Side includes players from Swan Hill, Warrnambool, Bendigo, Shepparton, Geelong , Mornington Peninsula and Metro areas. The trial match gave the many spectators a snapshot of State wide talent. The final result saw the Elbows nudge out the Arms (15 points to 11) in a keenly fought contest, which saw excellent wins to both Sides and many closely contested games. Lochie Tighe, who has coached Commonwealth Games and World Champions, inspired the Squad with his half time speech, emphasizing the importance of teamwork and the collective value of ALL players in any Side. 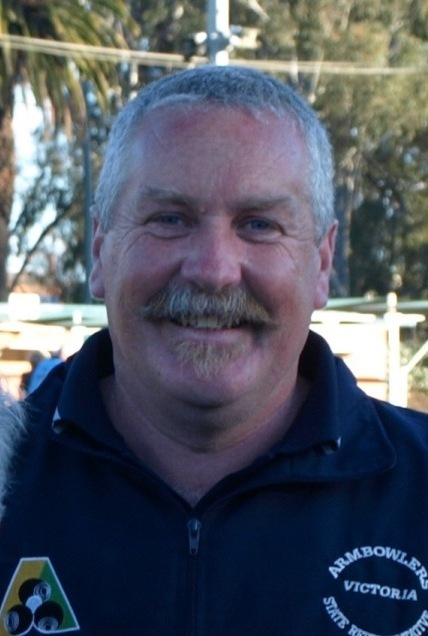 Bowls Victoria Director Phil Gude, who coordinates the Armed VIC Side said – “this was a very important hit out for the Squad as we get to know each others game and to finalize the Side for Beresfield”. Phil Gude presents Lachlan Tighe and Andrew Ross ( Vermont South Match day Coordinator) with Certificates of Appreciation from The Armed Vic’s. Lachlan watched the second half and later joined John Snell and the Armed Vic’s Selection group to offer advice regarding player selection. A great day was had by all participants. Good day for a “hit out” and a wonderful competitive spirit on both sides! Isn’t it good, I don’t have the final scores, but there were ups and downs, some unexpected. Vermont South put on a great spread and had many hands on board to help out on the day, which included catering & entertaining a very large corporate group on another green. The “Armed Side” meets again on the 7th September (Father’s Day). See ya there! On Sunday the 24th August Vermont South BC are hosting a Bowlers Arm Challenge match between the State Arm Squad and a Lachlan Tighe led Invitation Side. Vermont South C.C.O. 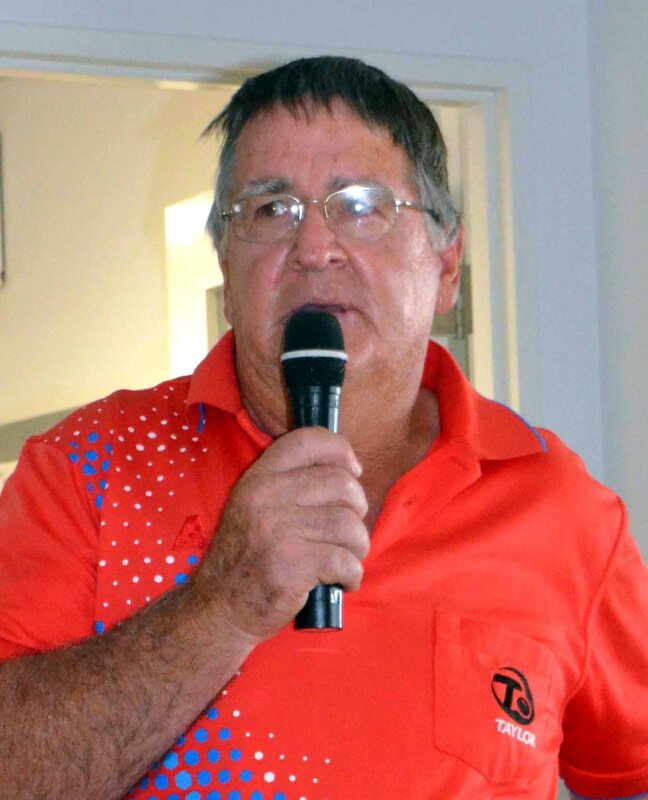 Keith Horlock said, “Visitors are always welcome at Vermont South BC and anyone interested in Arm Bowling should consider a day out next Sunday and witness some excellent Arm Bowling as the State Squad tune up for the National Titles at Beresfield Newcastle in a few weeks’ time”. Play will commence at 10.30 and run all day with teams playing Fours, Triples, Pairs and Singles. “Hope to see you at Vermont South BC “he said. Bowls Victoria is pleased to announce that eleven clubs from Regional and Metropolitan Victoria have committed to run Arm Bowling Events again this season. This comes on the back of an outstanding events season just gone culminating in Victoria’s success in winning the Inaugural National Arm Bowling Title last year. Bowls Victoria Chief Executive Graeme Bridge enthusiastically stated, “ We are very pleased with the response from Clubs and excited about the growth in this aspect of our Sport. We will have a very busy Bowlers Arm Tournament Season again this year”. WANT TO BE IN IT BUT NOT LISTED?? “We will be running three Arm Coaching days again this season at Shepparton, Ballarat and Geelong with a possible further day to be announced. Bowling Arm events and Coaching Days are listed here. Sandbelt is holding an “Armed Bowling Clinic” suitable for Coaches and individuals on the 22 Aug 2014 at the Moorabbin Bowling Club. Click here for the Flyer and details. Bowls NSW have announced the makeup of their State Armed Bowlers Squad for the Beresfield Challenge in Sep 2014. Bowls Vic have announced the makeup of the Victorian State Armed Bowlers Squad for the Beresfield Challenge in Sep 2014. Some 35 players from last year’s successful side plus winners of qualifying Arm events and others who had major achievements underwent trials to determine the Side. As with past years Selectors and Senior Players from Heathmont supplemented by State over 60’s regular Barry Anset, who is arguably the best arm exponent in Australia plus a legend of the game former State and Australian Champion John Snell now an Arm bowler himself undertook the task of final selection. BV Director and Arm Bowling Coordinator Phil Gude said, “We are indebted to this selection group and I thank them for undertaking the task. Each year the standard improves which of course makes selection more challenging. I would like to congratulate all who participated in the trials, we could field two very competitive sides,” he said. Seven new players have won their way into the 2014 Side which again has a great spread of players from across the State which is also encouraging for the future. THE ARM BOWLING SIDE 2014. Barry Anset, (Golden Square), Ray Arnold (Rosebud),Barry Atkins (Sunbury), Ray Bezett (Dromana), Pamela Bryant (Edithvale), Stephen Coles (Nth Balwyn), Neil Crisp (Warrnambool), Graham Edwards(Swan Hill), Malcolm Finch Golden Square), Peter Gribbin (Pakenham),Phil Gude (Dromana), Tony Long St. Leonards), Brian McMahon (Warrnambool), Arthur Parker (Main Ridge), Ian Ridley (Karingal), Adele Ryan(Ocean Grove), Michael Scotter (Heathmont), Dennis Smyth (Shepparton Park). 26/04/14. Trial Day – Heathmont. Final Trials for the next “National Bowling Arm Assault” against South Australia and New South Wales were held at Heathmont today in an effort to find and declare the Victorian Side Members to contest. For the most part it was steady mizzle rain. It was played on Synthetic over 2 games of roughly 10 ends, with each player having 2 bowls per end (whether a Triple or Four). Heathmont Club put on a wonderful pre-game spread, soup for us lazy people at lunch and tea & coffee as req’d. Barry (Hoppy) Anset, John Snell, Bob Dean and others worked hard over the facts & figures all day. Thanks for their effort. Many travelled some distance to be there today and had to play on a surface not necessarily to their liking. Your selection, or non selection, will be advised by mail at the next mail day (?) hopefully. We must all thank the Selectors………for that, not dragging it out. We all have things, holidays, bowls and other aspirations that we want to focus on, as we should, but having a focus determines our lives for the next 12 mths. So be prepared one way or another! Was good to catch up with John Snell! (G’day Terry) To read more about John go to our “Profiles” section. Check out “tournaments” for Armed events as they come up. Warragul has one 4/5/14. Entries close 29/4…please consider! “There is no other smile like that!” Thanks John. They had 3 greens full with 144 armed players and 29 volunteers on hand to cater for all needs and eventualities. Morning tea, lunch and afternoon tea was “full on” and I must say I’ve never attended a better run, better catered for day than this! Winners of the day with 3 games won and +35 were the Karingal team of Tony Murray, Barry Fossey and Ian Ridley. They were presented with the “Alby Ashley Shield” which stays at City of Frankston and each received a memento to keep as well as the well deserved prize money. A great day City of Frankston…..see you next year. This is just an update on progress so far this season. Events have been scheduled and played at Swan Hill, Strathmore and Heathmont. Unfortunately the Strathmore event had to be called off due to the extreme temperature on the day in question; however the club had a very good response to their event and regretted having to cancel. We wish them better luck next time. Swan Hill held their event last year and had another very successful event I understand. Heathmont held their event last Sunday and filled three greens with a triples event –a great first up start for them. Congratulations go to Mike Scotter and the Heathmont Team for running a great day. Barry Atkins & Team were the outright winners—well done guys. I announced at the Heathmont event that we would be developing a Squad of Top Arm Player/Coaches to assist with the further Development of Arm Bowling in Victoria. Several of the State Arm Bowling Side are great coaches who will be running SPECIAL COACHING DAYS/EVENTS to help Bowlers using or interested in using an Arm, so keep an eye out for further details in the Bowls VIC Bulletin. I hope to develop and grow the list of Coaches who use an artificial arm to provide a resource for players and clubs to access over time. We are looking to run only three SPECIAL COACHING DAYS this year to set the process in place but could do more if the demand is there. If we are to keep players enjoying our great game when their body tells them bending is too difficult to continue in the traditional delivery mode, we need to have a body of ARM COACHES available to take players on a new Bowling journey. In any sport the better you play the greater the enjoyment and good Coaching is a vital part of that. There has been a very good response to the supply of this Bowls Vic’s Player List by clubs, but as sometimes occurs we have found some address details provided are not accurate. We ask each Club running events to advise myself and copy Graeme Bridge at Bowls VIC and advise us of any corrections. We will keep the list as accurate as the information provided and make updated copies available on request. Also of vital importance to the long term success of this project is the “ability to grow the list”. We are requesting all Clubs running events that attract players NOT on the list to send us the details of these players so we can grow the list and thereby benefit all participating Clubs. Thank you and your clubs for being a part of the Arm Bowling Explosion in Victoria. We are ‘on the move’ now and I am certain very many players will appreciate the effort you and your club are making on their behalf. 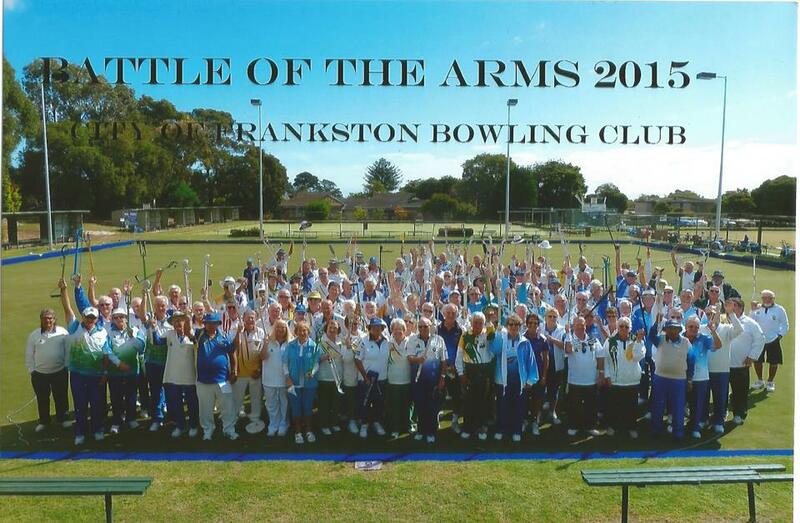 The 2014 National Arm Bowling Event will be held in NSW at Newcastle at the Beresfield Bowling Club on September 14, 15, 16. We are looking at the performance of players in the upcoming events to invite players to try out with the current team members. Winners of events that have 30 entries or more will gain an automatic invitation to trials, and others will be identified by our scouts. Victoria will be defending its National Title and we expect a massive effort will be made by the other States to rest the title from us, so we will need to select the best possible team available to defend our National Title. Click here for the Belmont Flyer 20/02/15. Warragul 08/02/15. Contact John Vickerman by email johnv@dcsi.net.au or Ph. 03 5623 4219. 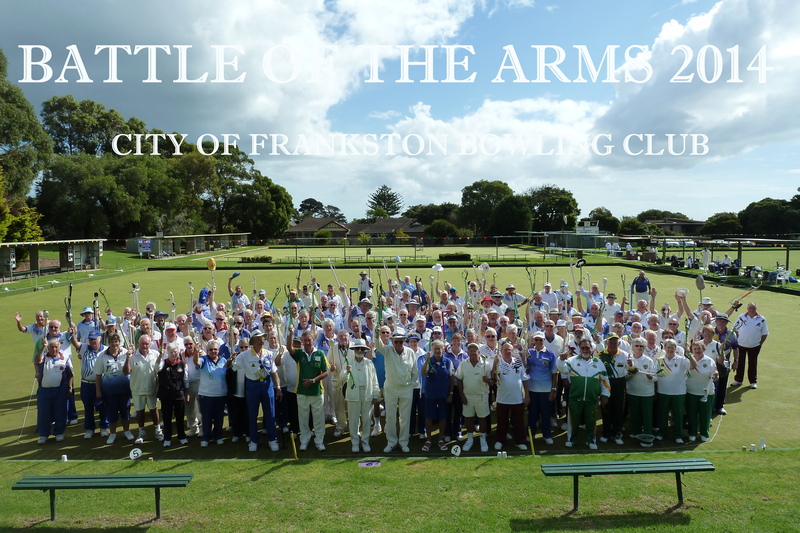 Click here for the original “Battle of the Arms” Frankston Flyer 12/04/15. Bowlers Arm Coaching Clinics Update Bulletin Fri 20/03/15. The session should be completed by about 2-30pm. Notification of all of these events is primarily to advise anyone interested in attending that if you don’t get in early and book a place for these popular activities that you’ll miss out on being provided with tips from some of the most knowledgeable exponents of the Bowling Arm devices going around. Bowling Arm activity makes up an ever increasing component of all members playing the sport and provision for people to gain confidence in using a device is what the Bowlers Arm Coaching Clinics are all about. For all other scheduled Bowling Arm Events and all relevant event details, contact information is available by clicking this link and sourcing the event(s) you are looking for. There is a lot of interest in regards to the Bowlers Arm Coaching Clinics that have been set down for Sunday 3 May at the Bareena BC in Geelong and two dates that have been planned for Armed Coaching Clinics to be staged in the Murray Mallee Bowls Region in the month of May. Swan Hill BC will be hosting a session on Friday 22nd May and Red Cliffs BC on Saturday 23rd May. We now have another Bowlers Arm Coaching Day that has been organized to be run on Friday 27th March 2015 and to be conducted at the Seaford Bowls Club commencing at 9-30am. This one takes on a different perspective in that it with an increase in the use of bowlers arms there is a growing demand for club coaches to become skilled in the art of coaching in the use of Bowlers Arms. As a consequence the Peninsula Casey Bowls Region is conducting a Bowlers Arm Coaching Development Day for Club Coaches. The day will be conducted by official Bowlers Arm presenters with a goal of working towards expanding the knowledge of our Coaches in the use of all three types of bowling arm fundamentals and techniques. Western District Arm Coaching Day – 25/01/15. Coaching Day at Preston Reservoir – 14/12/14. What a fantabulous day we had at “The Lakies” AKA Preston Reservoir B. C. A great turnout once again as Arm Bowlers and prospective Arm Bowlers find a new “lease of life” through using an “artificial bowls dispenser”! The Club put on a great meal and ran the day like Clockwork! Coaches currently in the State Squad and other invited Coaches brought with them “pockets full of tips, tricks and basic skills”, all you could wish for really, whether you be a novice, a newy or an accomplished ARM Bowler. Picture: Green 3: The Advanced Group led by Barry Atkins (Romsey) assisted by John Bryant (Edithvale) and Bill Ryan (Ocean Grove). Shepparton Park BC has shown why it is chosen to host the Victorian Open with the running of a hugely successful Bowlers Arm Coaching Day last Sunday. Ninety players registered for the event sponsored by Bowls Victoria and jointly run by the Club and the Victorian Arm Bowlers State Side members. This was the first foray into country Victoria and by the favourable responses from the players which were summed up by Kerry Ralph when she thanked Bowls Victoria Director Phil Gude for bringing the Coaching day to Central Victoria. “This proves we are on the map, the help was fantastic and I know the players all benefited from this experience. We are so pleased you came to the country.” she said. Moorabbin Bowling Club, in supporting Sandbelt Region’s thrust to improve Arm Bowling Coaching, hosted a Clinic/Seminar on Friday 22nd for Coach’s, current armed bowlers and prospective users (those that have been told to use an arm, but not yet done so). 63 attended, and the enjoyment and improvement was palpable. The Convener was Leon Cohen a member of the Armadale Bowling Club, from the Melbourne Beaches Region. He did an “absolutely fabulous” job and I’m sure, it will turn out; as he said, with those that attended losing many friends when their new skills emerge! Thanks Leon, Sandbelt, Moorabbin B. C. , all who assisted and all that attended. The Bowlers Arm Coaches Group are working with the BV Coaching Chairman Graham Howard and B.V’s Scott Nicholas to develop a training module for Club coaches to assist in the instruction of players moving to the Bowlers Arm. B.V. are very excited at this development. B.V. Director Phil Gude said “Arm Coaching is already having a positive effect on the improved standard of players available for State selection and this development will enhance the overall coaching offering greatly”. When developed the module will train accredited coaches in the use of an artificial arm and form part of the coaching pathway. Acting Chief Executive Peter Delaney said, “Graham Howard and his team have made a significant difference to the development and support of our Coaches with their new “can do” approach and this will further enhance Victoria’s Coaching leadership”. Players are already registering so don’t miss out get you name in for this great day. You will learn from three members of the State Bowlers Arm Side who are Coaches, Barry Atkins, Mike Scotter and AJ Parker, Also a former State Player guest speaker is being organized to give a few tips on bowling at competition level. It will be a great day. Bowling Arm Events and Coaching Day details are listed here. It was a great turn out again, for the second Bowlers Arm Coaching Day, this time at Melbourne Cricket Club Bowling Club (Swinborne Ave). Today’s (Sat 22 March) Clinic reached sellout early with both greens overflowing. These days are generating a considerable amount of interest, from Bowling Arm users far and wide if numbers and distance travelled are taken into account. It seems there is a keen desire for more of this. The first Coaching Day held at Dromana BC on 23 February had over 100 bowlers turn up. Those who attended today’s event (about 90) at MCC were similarly pleased with the expert advice and help they received from the Coaches and their assistants. MCC put on a fabulous BBQ & Salad lunch and provided an army of helpers who diligently and tirelessly sent back delivered bowls. Hope you guy’s are OK? There will be another session before next seasons pennant begins, stay tuned. A fair-weather day, beach side for the” Inaugural Bowlers Arm Teaching Day” held at the Dromana Club Today. M.C. Phil Gude introduced “Arm Coaches” Barry Atkins, AJ Parker and Michael Scotter. Barry spoke with experience, on behalf of the Coaches and it was out on to the carpet greens thereafter. Lunch was magnificent (a beautiful lunch for just $5!!) and thanks to the Volunteer’s who served in the kitchen & bar…and of course to those that did all the out work, before and after, those that took our money and recorded our table no’s , and those just there to record and promote the day. Barrie Lester was riveting (!!!) at the lunch break. Thanks Barrie for the tips you willingly shared. It is all about sharing!!!!!! Believe me. Loved your talk and more especially your demonstration on how to overcome the “Pigeon toe” step. To those that attended and those that did not, please offer up your contact details to Bowls Vic so that you can compete with all the friends we hope you met today at our next “Bowlers Arm Tournament”. Please note Melb. Cricket Club B.C. (in Swinbourne Ave) have a coaching clinic on 22nd of March, please contact them if you attended today (at Dromana) and want to advance to the next level, or if it is to be your first, they’d still love to see you……there’s lots to learn, and you will get help. Three Edithvale Coaches presented a Bowling Arm Seminar today at Clayton. Pamela Bryant, Pat Sherriff and John Bryant, were invited by Graeme Archer – Bowls Development Officer at Clayton to run this seminar. The session started at 11 am and finished about 12.30 pm. There were 10 Clayton Players, 1 from Noble Park and 1 from Karingal. We started out on the “Aiming Line”, moved on to a “Point of Focus” and “Constant Angle”. “Stance” followed. We then moved on to aspects of momentum (weight/height) on to the “Swing”, followed by the “Step” and “Follow Through”. Lot’s for every bowler to learn! Perhaps too much, but I hope they keep the paper, revisit it from time to time and learn from it. To read the paper presented on the day click here on the link above.